Looks like we'll be heading back to St. Bonaventure Hospital! On Feb. 5, ABC announced that The Good Doctor has been renewed for season three. The medical drama - which is based on the 2013 South Korean series of the same name - first premiered in 2017, and has gained critical acclaim over the past two seasons. 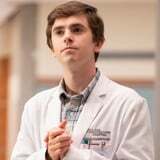 Not only is the series filled with incredibly moving storylines, but it is also bringing awareness to autism through Freddie Highmore's brilliant portrayal of Shaun Murphy, a young surgical resident who has autism and savant syndrome. While a release date for season three hasn't been released yet, you can probably expect more episodes to drop sometime next Fall! In the meantime, you can catch up on all the drama on Hulu!